To be sure of going gorilla tracking, it is a must you buy a permit which is issued by the Uganda Wildlife Authority (UWA) at USD 600 only. 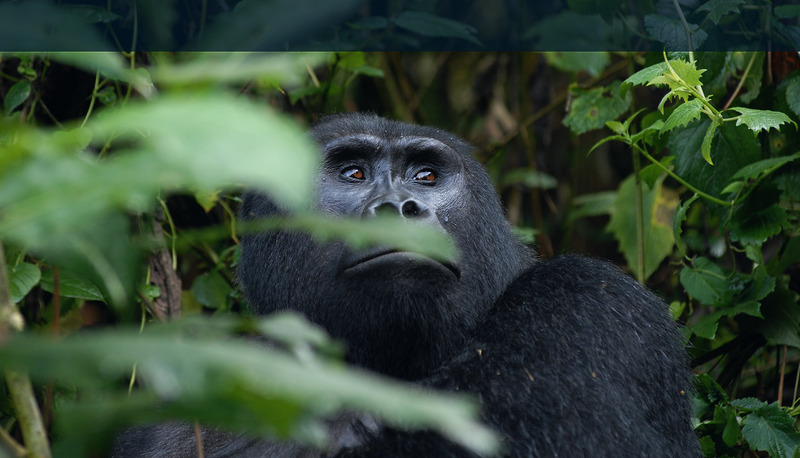 Only eight people are allowed to visit a group per day; this minimises behavioural disturbance to the gorillas and the risk of their exposure to human-borne diseases. UWA uses the funds generated from the sale of these permits for the management of the National Parks. A percentage of the funds raised from park entrance fees are also donated to local communities living adjacent to the parks to contribute to their development and improve natural resource management in the region. By following these rules and through the purchase of the permit, YOU too are contributing to the conservation of the mountain gorilla. 1. No one with a communicable disease (e.g. flu, diarrhoea is allowed to enter the park). 2. Do not stand over them, stay together in a tight group while with the gorillas, don’t surround them. 4. Do not smoke, drink or eat when you are near the gorillas. Eating or drinking inevitably will increase the risk of food/drink morsels/droplets falling, which could increase the risk of transmission of diseases. 5. Turn away from the gorillas if you have to sneeze or cough, cover your mouth and nose in the process. 6. Bury all human faeces a minimum 30cm deep and ensure that the hole is adequately covered. 7. Do not litter. All litter must be carried out of the park and disposed of properly. 8. No person under 15 years is allowed to track gorillas. 9. Do not make a loud noise or move suddenly. Ask in a whisper if you must. 11. Do not spit on vegetation or soil while in the park. Use your hankie of another garment. 13. Sometimes the gorillas charge. Follow the example of the guide (crouch down slowly, do not look the gorillas directly in the eyes and wait for the animals to pass). Do not attempt to run away because that will increase the risk. 14. Do not touch the gorillas. They are wild animals. 15. Do not look at them straight in the face instead give a sideways glance. 16. After the visit keep your voices down until you are 200 metres away from the gorillas. Adult males range, 1.65–1.75 metres in height (5 ft 5 in–5 ft 9 in), and 140–200 kg (310–440 lb) in weight. Adult females are often half the size of a silverback, averaging about 1.4 metres (4 ft 7 in) tall and 100 kg (220 lb). Gorillas have a facial structure which is described as Mandibular Prognathism. Almost all gorillas share the same blood type (B) and, like humans, have individual fingerprints. *A visitor shall be declared unfit for tracking if they are ill by a warden-in-charge in the park, 50% of the tracking fee will be refunded. Illness is determined at the discretion of the warden-in-charge. The cancellation policy will apply to visitors who fall sick before their travel to the park. *Permits are non-refundable but visitors who track the whole day and fail to see them for whatever reason will be refunded 50% of the tracking fee. *The gorilla permit is not a guarantee that the gorilla will be viewed. * Chances of seeing the Gorilla are 98%. 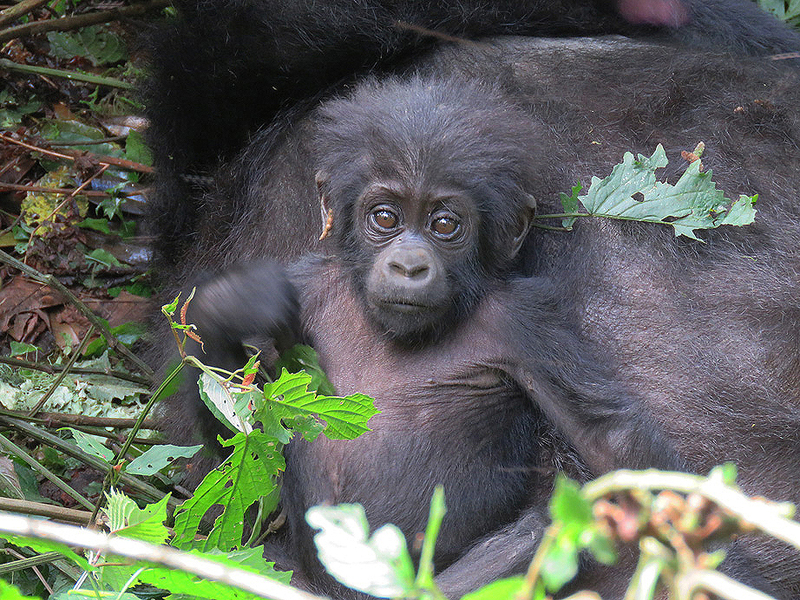 *The minimum age limit for visiting the gorillas is 16 years. Ankle level boots are ok but make sure it is something handy. Thick trousers and a long sleeved top. A pair of binoculars if possible.